So I have an existing thermostat cable on my 2nd floor that only has 4 wires, and I need a 5th wire to use as the common wire. Can I use the existing cable to fish or guide a new 6 wire cable through down to the basement? If so, what kind of tie or connection should I use between the two wires so that it doesn't come loose as I pull the cable through, and to keep it streamlined so that it can slide through holes or whatever it's going through? Is it better to pull the cable from the top floor or from the bottom floor? Is there a chance I'll get stuck or lose the cable in the wall - and thus should I just leave it to the professional? Any tips in general for this? Is this recommended? That's a very labor intensive approach considering some of the latest technologies. Have you thought about converting to a Wireless Thermostat? 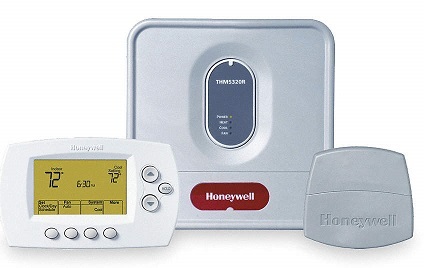 Take a look at the Honeywell YTH6320R1001. You might also consider a cheaper option with the VentStar Add-A-Wire. 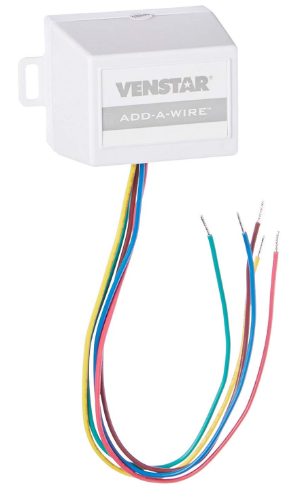 This setup allows you to use your existing four wires and still be able to have a common wire. It's an ingenious idea that piggybacks unused wires and converts them into one common wire. Not the answer you're looking for? Browse other questions tagged electrical wiring thermostat-c-wire cables or ask your own question. Is it feasible to pull individual conductors out of a 20m CAT3 cable? Can I use extra wire from two separate cables to add a washing machine in a garage? Proper way to run and fish electrical wire in Canada?